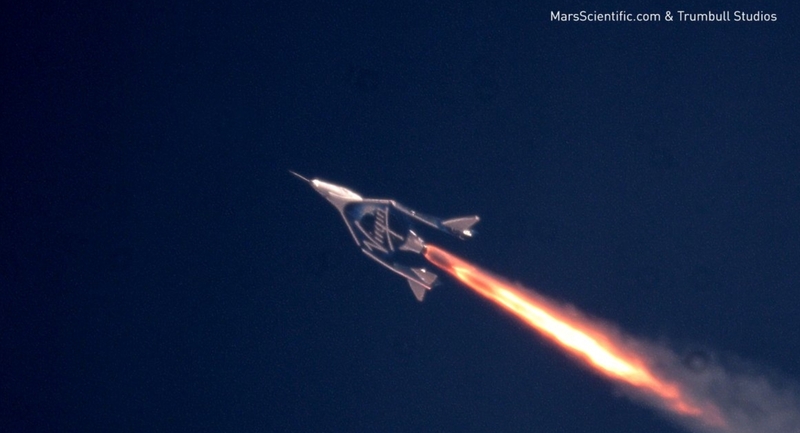 Virgin Galatic took another step closer to realizing its long-fought dream of carrying paying customers on a suborbital ride into space with a third powered test flight for the VSS Unity. Thursday’s test was piloted by Dave Mackay and Mike ‘Sooch’ Masucci and appears to be another successful flight pushing the vehicle to new heights. Although no date has yet been provided as to when commercial operations will take place, this third powered flight is showing the company is on the final leg to realizing that goal. It’s been 10 years since Sir Richard Branson initially claimed Virgin Galactic would be ready to launch passengers, gaining deposits from over 500 customers. Faith in the long-term aim was strong, with a customer base that stood by the company even during its darkest period when the VSS Enterprise was lost during a test flight in 2014, four years into its test program. Virgin Galactic had to first mourn the loss and then fight back from the tragedy, working with the findings of the National Transportation Safety Board (NTSB) investigation to improve their design and implement them in a new spacecraft. That new ship, called VSS Unity, was eased into service, mindful of the fact any more accidents could be a hammer blow for a company facing competition from the likes of Blue Origin. Thankfully, the test program to date has proceeded without issue, with April of this year marking the first powered test of the spacecraft since that ill-fated day four years previously. Numerous mated glide tests had taken place during the previous year to prepare for the milestone. 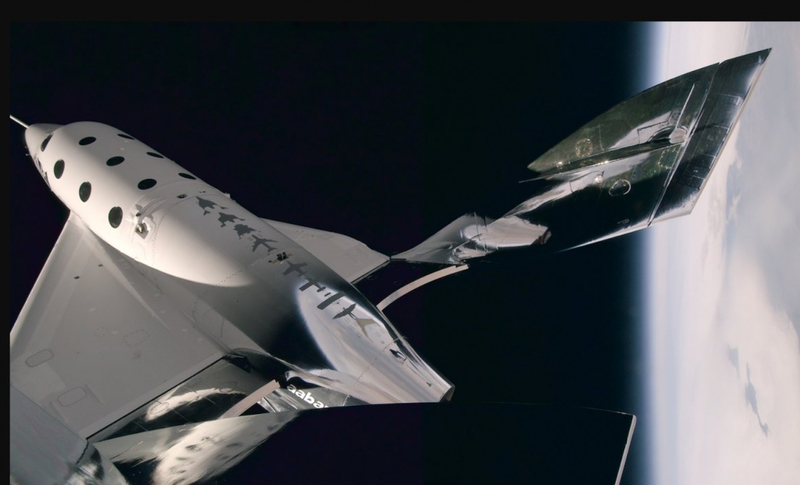 Via what is an incremental test series, the second powered test followed in May, with the focus of the test to learn more about the spaceship’s supersonic handling characteristics and control system’s performance with vehicle parameters that were closer to the ultimate commercial configuration. For that flight, the motor burned for the planned 31 seconds – which is less than the full flight duration – propelling Unity to a speed of Mach 1.9 and an altitude of 114,500 ft.
Thursday’s third powered flight pushed VSS Unity to new heights, literally. Following rollout on to the runway at the Mojave Air and Space Port, the Virgin Galactic and “The Spaceship Company” workers conducted final checks on the mated vehicles, prior to giving the green light for VMS Eve – piloted by Todd Ericson and Kelly Latimer – and VSS Unity to take to the skies. 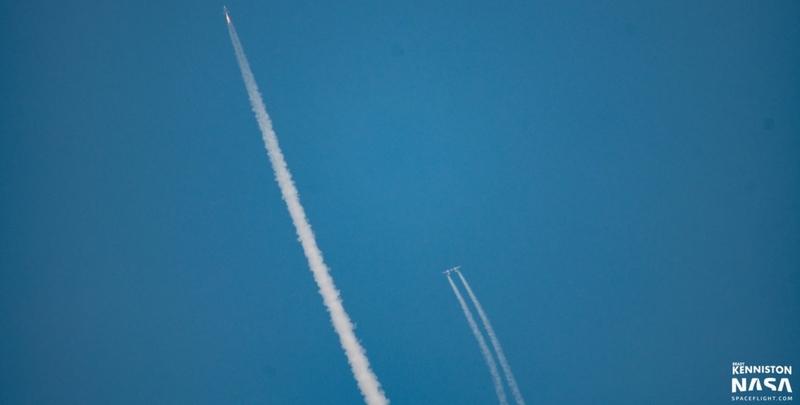 The two vehicles had a long trip to their release altitude, which was marked at 46,500 feet. With additional checks conducted, the VSS Unity was released and soon after fired up her engine for a burn time marked at 42 seconds, the longest to date. This saw VSS Unity achieve Mach 2.47, powering uphill to an apogee of 170,800 feet – or 32.3 miles. With the engine shut down, the spacecraft continued her upward momentum before a feathered re-entry cycle that began at 52 kilometers. “Virgin Galactic test pilots broke Mach 2 this morning, as VSS Unity took her third rocket-powered supersonic outing in less than four months,” noted Virgin Galatic in a post flight release. “After a clean release from carrier aircraft VMS Eve at 46,500 ft, pilots Dave Mackay and Mike “Sooch” Masucci lit the spaceship’s rocket motor, before pulling up into a near vertical climb and powering towards the black sky at 2.47 times the speed of sound. “The planned 42 seconds rocket burn took pilots and spaceship through the Stratosphere and, at an apogee of 170,800 ft, into the Mesosphere for the first time. Following a smooth glide back to Earth, she landed at Mojave Air and Space Port, soon followed by VMS Eve. The mannequin referenced by Mackay will likely be used to collect data on the flight for future passengers, ironically akin to the test data gained by Blue Origin’s Mannequin Skywalker. “Having been a U2 pilot and done a lot of high altitude work, or what I thought was high altitude work, the view from 170,000 ft was just totally amazing. The flight was exciting and frankly beautiful,” added Mike “Sooch” Masucci. Those tests included cabin analysis systems record a host of parameters that are designed to help us further understand the environment inside the cabin during powered flight – temperatures, pressures, humidity, acoustics, thermal response, vibration, acceleration and even radiation. It is not yet known when the next test will take place, or how many tests remain before VSS Unity is entered into commercial service.